Postmark is not controlling, the application must be in the Office by midnight April 15, 2013.
wdemand@ocua.com and include "Boat Grant Application" in the subject line. b) Information about your teammates and their sailing resumes. c) Letters of recommendation and contact information from two sailing references. They can be a current or former coach, a competitor, a member of your yacht club, or any other sailing reference who knows you well. 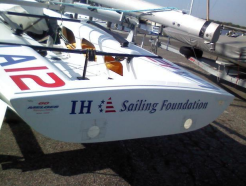 There is a review committee of four E-Scow Sailors and one IHSF board member who will review all the applications. please submit them and we will post the question and answers for all applicants to read.